Need more information about booking Home 268135 ? 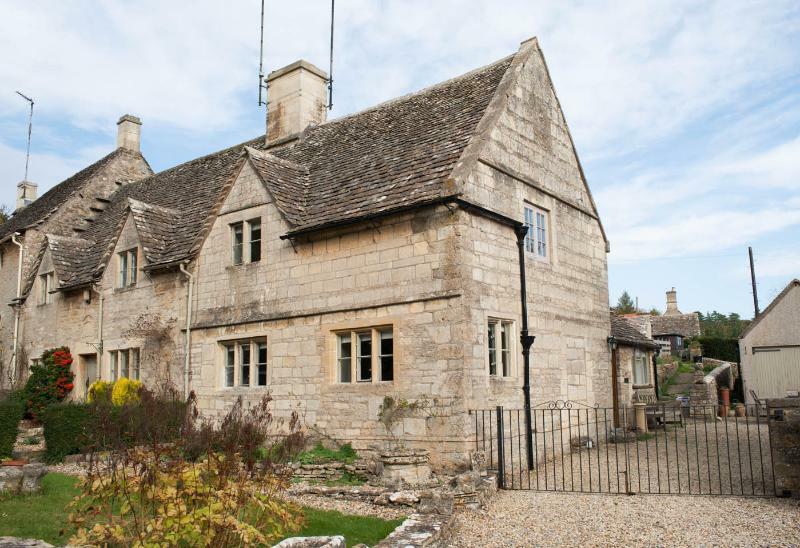 The cottage was built in the 18th Century and is Grade II listed Cotswold stone. It has many of its original charming features such as exposed beams and an open fire. There are 3 bedrooms, 2 doubles and a twin, the rooms are immaculately clean with fresh cotton bedding and lovely views. The cottage has been recently refurbished with modern, stylish interiors making it great place to spend some time away from it all in this beautiful little village. The contemporary kitchen is equipped with everything you may need, there is a small table in the kitchen or you can choose to move into the living area which hosts a large dining table. You can also dine outside in the seating area if the sun is shining! The large living room has 2 big leather sofas and 3 window seats as well as the dining table so makes it great communal room for all. There is a selection of toys and DVD's to keep the kids happy as well as an elevated lawned area to the rear of the property. Bang in the middle of the outstandingly beautiful Cotswold countryside, there are lovely walks to take from your doorstep. Bibury has a river running through, a trout farm and couple of pubs/restaurants. The cottage can be used as a base to explore the many surrounding villages and small towns such as Burford, Cirencester and Cheltenham. You also have the Cotswold Water park just down the road with an array of water sports. You can access the cottage at 3pm on your day of arrival and you are required to vacate the property at 10am on your day of departure. This Cottage has 3 bedrooms, 1 bathroom and sleeps 6. It’s been listed on Holiday Lettings since 05 Jun 2014. Located in Cotswolds, it has 7 reviews with an overall rating of 5. The average weekly rate varies from £642 to £1077. The Owner has a response rate of 85% and the property’s calendar was last updated on 20 Apr 2019. Just come back from staying at 33 The Square Bibury for our sons wedding at Cripps Barn. Beautiful house in the stunning village of Bibury, everything was there for us just like being at home, toiletries, coffee sugar tea bags and milk. The weather was very cold so when we opened the door to find the house was already warm was delightful. Communication with Rachael was impeccable, sat nav led us up the wrong lane so my advice is as you go through bibury and go up the hill take the second right and the house is on the left. I thoroughly recommend this cottage in a stunning village. What an amazing cottage that was. Stylish, cozy, warm and simply lovely! The beds were comfortable, everything was immaculate, nice kitchen with everything you need. And we even had a little milk left for us in the fridge and tea and coffee. Really enjoyed our stay there. My family and I had the most wonderful time at this cottage. We attended a wedding at The Swan Hotel which was only 5 mins walk away. The cottage was spacious, well equipped and immaculate, would definitely recommend and revisit. Value for money. Lovely cottage. My only issue is that it doesn't say anywhere on the details that there is only a bathroom on the ground floor which isn't easy when you have a toddler who still needs to loo in the night. Apart from that the cottage was great. Highly recommend it. Lovely part of the country.